Have I hit a new low? Resorting to having not only AYCE Japanese; but AYCE Japanese at Sui Sha Ya! Not sure if you can even call it Japanese food to tell you the truth. 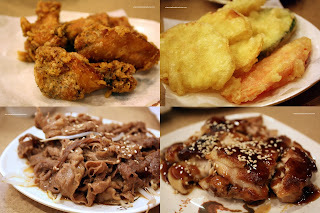 There was one point in time that Sui Sha Ya was one of the few places that offered AYCE "Japanese" food. Thus, I have to admit, I did do the occasional meal there during my University days. With those days way in the rear view mirror, I have graduated to much more quality Japanese food. Besides, I can't get my money's worth at an AYCE anymore. I'm happy to report that the whole experience started off on the right foot since they only charged both of my kids only $3.00 each. Not bad considering that BC Sushi wanted $16.00 for a 4-year old! All Sui Sha Ya locations went through extensive renovations a few years back and they're fairly clean and modern. In all honestly, I only wished that they updated their food too (but I'm getting ahead of myself here). So we checked off quite a few items and prepared to wait. Within 2 minutes, we got practically all of the food we ordered. Instead of Fists of Fury, it was Food of Fury as the plates started to crowd our small table . I couldn't even keep up with the picture taking. This is particularly disturbing since sushi and fried food should not come out that fast. Conclusion - most of the food is sitting around ready to be served. If it isn't bad enough to butcher Japanese food, they need to make sure they serve it at the wrong temperature as well. We tried the roll sushi first. There were 2 pieces each of Futomaki, Chopped Scallop and Unagi. Looking much like the sushi you'd find on a cruise ship buffet, the rolls looked practically alike except for the filling. Viv made a face immediately a fter one bite. "It's cold and hard!" Uh... what? Oh right, the sushi (mind was in the gutter for a minute)... That's right folks, what we have here is a case of the pre-rolled sushi. Thus, the poorly prepared rice was not only mushy; it was cold and mushy. On the subject of mushy, the Tuna Sashimi was mushy and quite cold. The Salmon Sashimi was actually decent tasting. However, instead of the nice shiny flesh of fresh fish; what we got was more like a matte finish. I can only hypothesize why that is. Left out too long that it began to dry out? Once again, another WTF moment was when we looked at the Oyster Motoyaki. The sauce was prepared so poorly that it completely separated. Thus, the oyster sat in a pool of oil among clumps of mayo. Resembling a scene from 'There's Something About Mary", this is probably one of the most unappetizing attempts at motoyaki I've ever seen. Consisting of cold mushy sushi rice with little vinegar taste, the Nigiri Sushi was terrible. Add insult to injury, the slices of Tai and Tuna were super thin. Served stone cold and looking like it had been violated in ways it shouldn't have been, the Gyoza were horrible. Imagine someone taking veggies and grinding them into a paste, much like those infomercials on food processors, sticking it into a dumpling wrapper and calling it gyoza. I'd rather eat a Balut than these gyozas. At least the Balut has texture (well, from the beak). Wait, scratch that, after seeing Chris eat it, I'm not so sure. OMFG, the House Ramen was the most feeble attempt I've ever seen. With noodles resembling Chinese "Haw Gee Mein", this was no more a ramen than Tiger is faithful. The broth was even more hilarious, it was flavourless except for some spiciness. Nissan instant ramen noodles hav e better soup base than this one. The "Char Sui" was pretty much Chinese char sui without the food colouring. I guess I shouldn't be surprised, after all the restaurant is Chinese operated. Incredibly, the Chicken Karaage was decent. It was actually hot, crispy and well-seasoned. We were probably lucky where the kitchen was preparing a large batch at that time. However, how hard is it to fry chicken wings? On the other hand, I'm not even sure why they bothered to call what we had "Beef Teriyaki". To me, it looked and tasted more like Jimmy's Beef Jerky. Extremely thin, marinated with some salty sauce and overcooked, it was a damn fine beef jerky on a bed of sprouts. So I guess we shouldn't have been surprised that the Tempura was lukewarm. Hey, it's a step up from stone cold; but again I'm really dumb-downing my expectations here! The batter was actually quite light; so it wasn't horrible. I didn't mind eating it. We also didn't mind eating the Chicken Teriyaki. It wasn't half bad. The actual chicken itself was juicy and tender and it was relatively hot. It's a shame that it was drenched in too much sweet teriyaki sauce. Chalk this up to being a Chinese rendition of teriyaki chicken. With great anticipation, we dug into the Tonkatsu. Why? Well, at Kawawa, it was more like "Ton-Can't-Chew", so we were not expecting too much. You know what? It wasn't half bad. No joke! It was tender inside and crispy outside. Too bad the tonkatsu sauce was a bit bland. But at least we could chew it. That is always a plus. As you can see, my expectations were quite basic here. We finally got dessert in the form of oranges and gelatin. The oranges were fantastic! The best part of the meal really. That says it all. I was laughing at the oyster picture! Too me, it looked like chocolate turd on egg tarts...and then I realized it was motoyaki! Anson, you want me die don't you? LOL... Probably not going to experiment any more with Sui Sha Ya! good heavens, i've never been there but i've heard nothing but bad things. you've gotta love a place that doesn't even pretend that they're making the sushi fresh by at least waiting more than three minutes to serve it. at least they're happy to show that they really don't care. and mushy tuna sashimi... bleh! Trisha, I can confirm everything you've heard is true, it's too bad I had to eat there to do this. Yah, no kidding, at least wait a few minutes before bringing every item I ordered! Yikes, I am glad I didn't go to the Richmond location! 'sigh' I remember loving going there back in high school. I think maybe it was because we found it entertaining to watch someone consume a huge chunk of wasabi. You're a brave man for going there! justpattiez, you are a good woman for saying what you said despite the fact you sorta know the owner! Great blog, Sherman! I stumbled across it and became engrossed as I work and now live in Burnaby, and had to start from scratch in building up a catalogue of trusted places to eat. I had to comment on this post as my family have been eating at this joint since the dawn of time, and it's an old reliable favourite. I think what makes the difference between our experience and yours relates to a number of factors: We never dine on the AYCE menu, only ordering a la carte. We've made of point of getting to know the servers and the manager (they're really nice people!) and we tip well and bring red envelopes for CNY - a small amount mainly for appreciation. There are winners and losers on the menu - we know what's what and tend to order from a list of favourites only. You've listed a number of them, but we also really enjoy the maui ribs, the seaweed salad, the karaage, and the tonkatsu as you mentioned, which my sis and I tend to get with the green salad. Aside from that, skip the noodles and teriyaki variations, and you'll find that when ordered a la carte, the gyoza and tempura come fresh and hot, and are competently made. The rolls are comparable to any other chinese owned japanese restaurant, and the sashimi comes in generous portions, if a little frozen to start. Because of our frequency of dining, they always give us 10% off our bill and free starters like gomae and sumonomo, as well as ice cream at the end of the meal. Like I said, it's a family fave, and I just wanted to give you another perspective on the place, aside from dismal AYCE. Hi lani! Thanks for reading! You know what? Way back in University, Viv and I would go to Sui Sha Ya a lot. But as time passed, the selection and quality of Japanese restaurants have increased exponentially. Thus, I guess it is the tried too much good Japanese food effect. For the masses, Sui Sha Ya would probably still do fine. When compared to better places, Sui Sha Ya maybe be inferior. With that being said, once again food is very personal and no one view is completely right. So I get what you're saying. I did enjoyed going to Sui Sha Ya during my university days too. Back then, I didn't know exactly what japanese food supposed to be like. From what I have read on your blog, it seems the food quality has really gone rock bottom in this place. I mean using Ha Gee Mein for ramen how pitiful can they get. can they at least faking it using nissin noodles. I am very curious how Sui Sha Ya can still be running these days with so many higher quality as well as actual Japanese run competitors in Greater Vancouver present.